Counselling is available in Bolton, Orangeville and Shelburne. Please call for appointments. Please click on the tabs below for more information on each workshop. Click the image below for a printable copy of our current Workshop flyer. Mondays | April 8-June 10 | 6:00 p.m.–7:30 p.m. Discover your strength, courage and voice in this 10 session, safe, supportive group environment. Understand why the harmful effects of abuse don’t have to last forever. Tuesdays | April 9-June 18 | 4:30 p.m.-6:30 p.m. Learn ways to help your children handle the feelings, self-blame and behaviours that arise in families that have experienced woman abuse. Children will be supported in managing these effects in their own age-appropriate groups. This safe, supportive program is tailored so kids have fun while learning that they are not alone. Wednesdays | April 10-June 12 | 10:30 a.m.-12:00 p.m. Understand why the harmful effects of sexual abuse don’t have to last forever. Discover your courage, strength and voice in this 10 session group. Feelings After Birth (FAB) offers support and resources in a small group setting to women (with babies under the age of one year) who are experiencing the additional stress of post-partum depression, anxiety, anger, irritation and other mood issues. Facilitated by staff from Wellington-Dufferin-Guelph (WDG) Public Health, Dufferin Child and Family Services, Family Transition Place, and the Ontario Early Years Centre (EYC). CHILDCARE AVAILABLE FOR CHILDREN UNDER 6. Learn the difference between positive and problematic emotions, how to increase your self awareness about these emotions and through individual and group activities, you will understand how to best manage these emotions. Fridays | March 22, April 12, May 3, May 31 and June 14 | 9:30 a.m.-11:30 a.m.
Join us every third Friday for an interactive and inspiring morning. 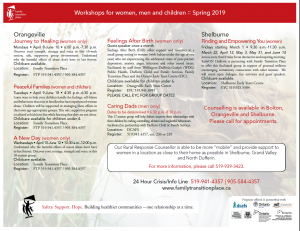 EarlyON Dufferin is partnering with Family Transition Place to offer this facilitated group in support of personal wellness encouraging community connections with other women. We will enjoy open dialogue, fun activities and guest speakers.